We at Eagle Animal Hospital strive to bring you the latest in veterinary technology. Companion Laser Therapy is a new, FDA-approved treatment that is used in human sports medicine and many other applications. This procedure does not involve any medications, surgery, or pain. It is used in addition to traditional treatments to relieve pain and inflammation, and to stimulate healing by delivering deep penetrating light waves to the affected tissues. 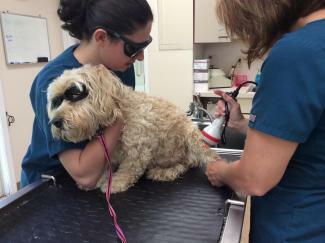 Call us today at 610-458-8789 to see how laser therapy can benefit your pet.